Many businesses have dedicated a lot of resources to try to figure out why content gets shared on the Internet. While many factors play a role in influencing what gets shared and what doesn’t, most experts agree that posting great content is essential. After all, why would people share something if it isn’t interesting in the first place? Once you have great content, getting it in front of the right people (key influencers) is also important. Getting these key influencers to share your content is going to go a long way in increasing the reach of your message. The question then is: Where should you post your content? The best advice that I can give you about where you should post content is to post it where your customers and potential customers hang out. That sounds easy enough… All you have to do is conduct a survey to find out what social networking sites your customers and prospects currently use, examine what social networking sites are currently driving traffic to your website, and/or look at the demographics of the users of each social networking site. Say that you find out that most of your customers and prospects are on Facebook and Twitter, but don’t use Google+, Pinterest, Tumblr, or any other social networking site. That means that you can focus on these two social networking sites and call it a day, right? You see, if you use this logic, you are forgetting the role that key influencers play in social media. 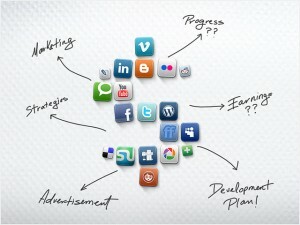 Let’s say that a lot the key influencers in your particular field use Facebook, Twitter, Google+, and Pinterest. Given all the potential noise that’s out there on Facebook and Twitter, it might be easier to get your message in front of key influencers if you post on Google+ or Pinterest. If the content is good enough, the key influencers will hopefully post it on the other social networking sites that they use. In this case, if they share it on Facebook and Twitter, it would put your content right in front of your customers and prospects, with the added benefit that it is being shared by people that your customers and prospects know and respect. That’s priceless. To complicate the matter even further, traditional media can also play a role in spreading your message. Now, before you go running to your coworkers to tell them that your business should be posting on Twitter in order to help get your content shared in other media, you need to keep in mind that the research is only saying that it is possible that your content will be mentioned by traditional media outlets if it is posted on Twitter. However, is it likely? Probably not. You will need to post some really remarkable content for it to be shared by the traditional media outlets. But, it could happen. There are a lot of things to consider when deciding where you should be posting your content. Before you write off a social networking site because you don’t think that many of your customers and prospects use the site, you need to consider where it will be easiest to get the attention of key influencers in your field. In some cases, this might not be the same social networking site that most of your customers and prospects use. With this in mind, it might make sense to maintain a presence on this social networking site, anyway. Furthermore, by posting your content on various social networking sites, it makes it possible for your message to be spread in other media, as well. In the end, though, you still need to post content that people find interesting. Otherwise, why would they share it? Photo credit: Rosaura Ochoa on Flickr.